-The umbrella reminded me of the short, albeit, heavy rain storm that moved through here this afternoon! -The cap reminded me of baseball, America's most beloved sport! -The striped tie and shorts reminded me of the our our flag! -The set comes with a "happy happy birthday to you!" greeting - Happy Birthday America!! -Of course, I used red, white, and blue as the color scheme! 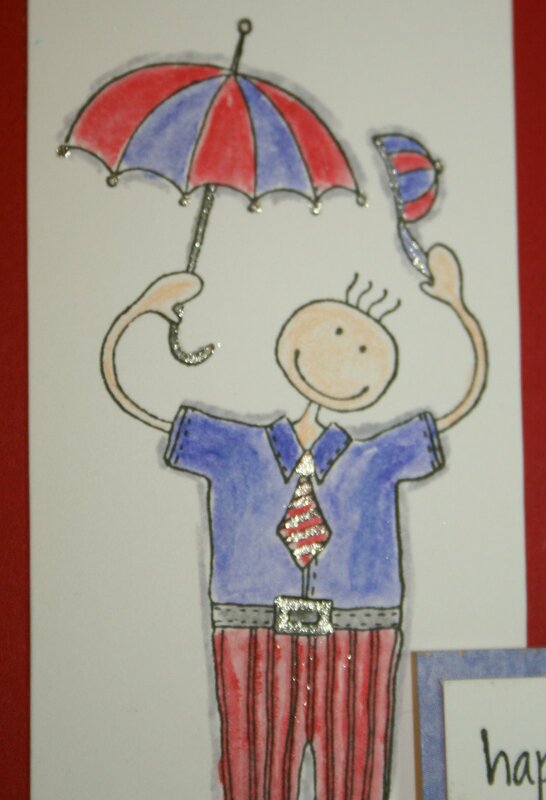 -And, I used the Stardust Clear Gelly Pen to add touches of glitter (think fireworks) to the umbrella, cap, tie, and belt buckle. The card was colored with our Lyra Aqua Color Crayons using the Tombow Blender Pen. For the paper I picked out the Cha Cha paper Collection and Scarlet Red cardstock. And once again, I finished it off with my favorite embellishment - Scrapper's Floss. The Journey to 1,000 - You Could Win! !